Doctor Jeff Pavell | Dr. Jeff Pavell | Jeff Pavell, D.O. Dr. Jeff Pavell has a passion for helping people with pain due to spine, sports and muscle injuries, and he is a perfect fit for the PM&R Center. He has followed an interesting path to arrive at this destination. While attending The Johns Hopkins University, Dr. Pavell became interested in the relationship between the central nervous system and the musculoskeletal system. His research at Hopkins connected him with an osteopathic physician who specialized in treating sports injuries with hands on manual techniques. Dr. Pavell’s enthusiasm for weight lifting and football left him ample opportunity to be treated for injuries by his mentor. He was quickly convinced, and decided to attend Osteopathic Medical School where he could combine the medical school curriculum with an education in these manual skills. 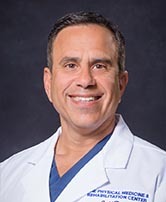 Dr. Pavell graduated from the New York College of Osteopathic Medicine with honors, and went on to do his residency and Chief Residency at the New York University Medical Center's Rusk Institute of Rehabilitation and the Bellevue Hospital. Presently, Dr. Pavell acts as an off-campus site proctor for Rusk Institute residents training for Rehabilitation Medicine. He then completed a fellowship in Buffalo in the use of fluoroscopic injections for management of pain and immobility. Today, he is board certified in physical medicine and rehabilitation, pain medicine, and sports medicine, as well as acupuncture, which he uses as complementary care for his patients. Dr. Pavell is currently the Chief of Rehabilitation Medicine at Englewood Hospital and Medical Center. Away from the office, Dr. Pavell acts as Race Director & President of the Haworth 5K as well as President of the Vikings travel soccer & football clubs. At the Physical Medicine and Rehabilitation Center, Dr. Pavell uses the combination of manual techniques, medication, physical therapy and injection to provide optimal patient care. He also teaches students and residents at Columbia University, where he is on the teaching staff. While he awaits an Orioles World Series victory and yearns to be out surfing, Dr. Pavell has fulfilled a dream of helping people with pain from sports, spine and musculoskeletal injuries. Mobilizations and manipulations of restricted joints under regional anesthetic block. Biomechanical evaluation of the musculoskeletal system. The Physical Examination and Treatment of Spine - Muscle Imbalances and Neuromobilizations in Musculoskeletal and Sports Injuries - A Hands-On Course Williamsville, New York. October and November 1998. Table trainer for course designed for health professionals interested in a multidisciplinary approach to spine care by incorporating rehabilitation principles into their practice. Daemen College - Department of Varsity Athletics - Team Physician, Amherst, New York. Team physician responsible for pre-participating examinations, game coverage, and medical care for male and female collegiate athletes. Buffalo Blizzard Professional Indoor Soccer Team, Buffalo, New York. 1998-1999 Season. Pre-participation musculoskeletal evaluation and shared game coverage. Curriculum Committee, Department of Rehabilitation Medicine, NYU Medical Center June 1997 - Present. Appointed as resident representative to faculty committee charged with revising syllabus for didactic component of resident teaching program. “Preventing Musculoskeletal Pain in Adolescents”, Interview by WINS reporter Alice Stockton-Rossini for segment which aired November 2003. Co-Authored chapter, “The History and Past History of Low Back Pain”, The Low Back Pain Handbook: A Guide for the Primary Care Clinician. Hanley & Belfus, Inc., Philadelphia, PA, In Press, Second Edition, 2003. “Back to Basics - Applied Anatomy and Physical Examination Workshop; Adverse Neurodynamic Tension”, Workshop Assistant Leader, Physiatric Association of Spine, Sport, and Occupational Rehabilitation, Seventh Annual Meeting, November 1999 McAdam, F.; Pavell, J.; Lembo, N. Functional Outcome of Patients With Lumbar Disc Herniation and Radiculopathy Treated With Nonoperative Care, (Manuscript in process) Seldes, R.; Grisso, J.; Pavell, J. Predictor of Injury from Recreational In-line Skating, American Journal of Public Health, February 1999, Volume 89, No. 2 Seldes, R.; Grisso, J.; Pavell, J. Predictors of Injury from Recreational In-line Skating: A National Study, Accepted for Presentation at The combined Meeting of Orthopaedic Associations of the English Speaking World, Auckland, New Zealand, February 1998.